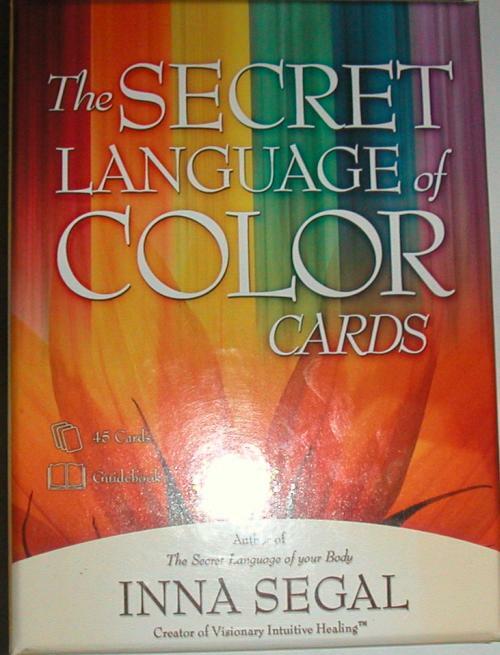 Last week I ordered a book The Secret Language of Your Body and a set of cards The Secret Language of Color by Inna Segal, both recommended my Maureen, my friend and colour therapist. We met on a Louise Hay teacher training course in 2003 but only really connected in 2006 when she did a colour reading for me. I was so blown away with it that we’ve been close ever since. Anyway, when I told her about the ankle issue in last Thursday’s meditation she gave me an alternative interpretation to Louise Hay’s inflexibility. It was from Inna Segal’s book which expanded on Louise Hay and made a lot more sense. Being a colour person she also mentioned that there was an accompanying set of cards. They weren’t so expensive so I ordered both. Although it was really the book I was interested in the cards got delivered first; arrived this morning and I took a few minutes out of writing Love is Not a Reward to have a little play. First off, they’re a beautiful set of cards, vibrant as well as colours, engaging images and silky smooth, appealing to both sight and touch. As I shuffled for a while a card fell out – Magenta – Connect to your deepest inner knowing. Duly noted I put it back and shuffled again, another card fell out – Magenta. This time I was very careful with my shuffling. 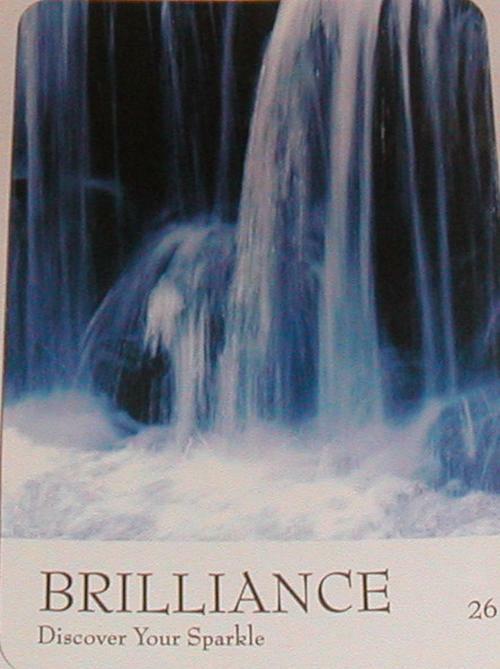 Pulled a card – Burgundy – Awaken your passion. 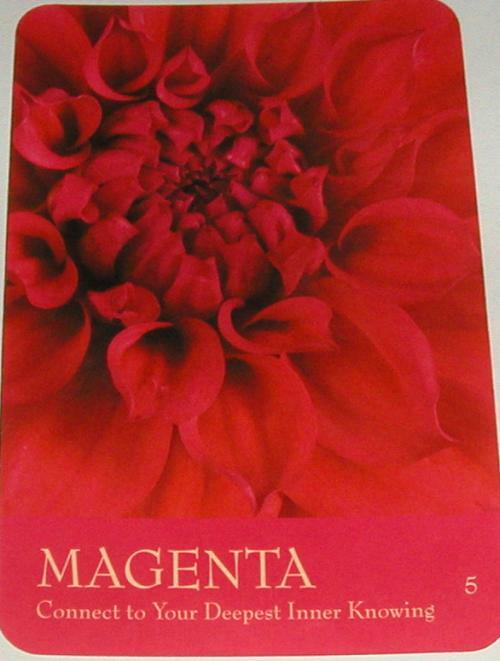 Pulled another card – Magenta. Well, I laughed out loud and took a few minutes to share it with Maureen, and as we’d worked with colour last week I decided to take the pack along to the circle to share with the others. The snow deterred all but me and my friend Tim, who’s now said it OK to name him in the blog. Tim and I turned up at Oak House where a smiling Mary and her eager dog, Molly, greeted us. ‘Oh, will it be cancelled if it’s just us?’ You could hear the disappointment in Tim’s voice. ‘I dreamed about you and Molly a couple of nights ago,’ I said stroking Molly as we waited for the drinks. ‘Really, was it something good?’ Mary chuckled (now there’s and old word) but she did, she chuckled. ‘What colour were they?’ I was a bit taken aback, I only knew of Molly. ‘I have pictures of them’ she headed to the wall as she handed over our drinks. ‘What colour was the other one?’ My chest tightened and I held my breath, waiting to see if she’d say white. I breathed out as Tim began talking about a dream he’d had. ‘What happened to the other dogs Mary?’ I interrupted Tim. I told Mary and Tim about my cards and she suggested we used them as our prop for the session, but first she wanted us both to have a go at doing an opening prayer. Tim said he’d go first, jumping in feet first as is his way. Actually, I’d misunderstood, thinking my turn would come next week, but no, Mary looked expectantly at me till she had to spell out that she wanted me to do one too. I didn’t have much time to think about the tightness in my stomach before I opened my mouth and let something come out, which was mostly thanking God for allowing us to be there and for allowing Mary to be such a caring and welcoming facilitator, and blessing whatever we would learn from each other. The opening prayer is something I’ve been dreading, and have, until that moment avoided in every group I’ve ever attended. So a big first and you know what? It wasn’t so bad, and something I might need to do more of in the new Course In Miracles group starting next week… but that’s another story… another blog. 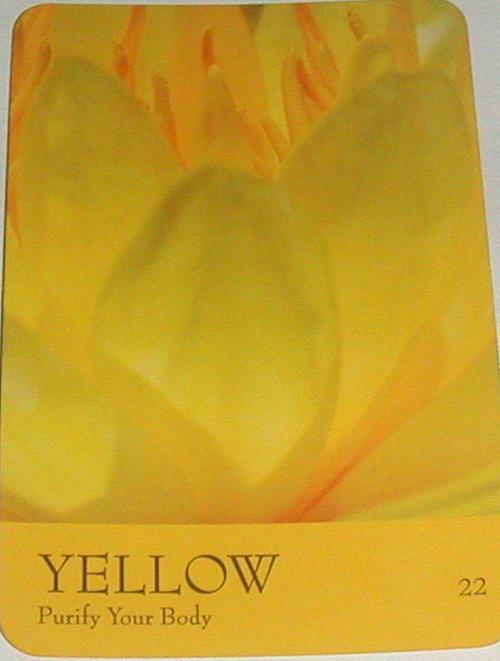 Mary encouraged us to look beyond the words on the card, to look closely at the pictures, to allow our minds to be open to any messages given in the sensation of the card, the feel of the colour. It was different to how I’m used to using cards. Because I couldn’t turn to the book for guidance I really had to focus. I found myself asking questions of the other two, based on their cards, that I had no way of knowing about them. Even Tim whom I’ve known for some time was surprised by some of what came up. It was the same for the other two when it came to telling me what they thought of my cards. My cards made a great deal of sense to me. Only an hour before going to the circle I’d looked in the mirror and told myself, ‘girl you need a facial’. The long dark days have taken a toll on my sparkle and I was feeling that a facial would help me put it back. I’ve also been thinking of carrying out another gall bladder flush which helps to put sparkle back in my eyes as well as my skin. 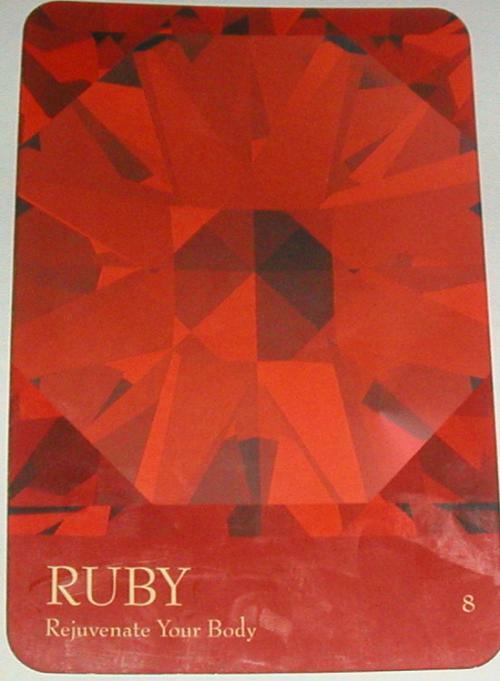 There was also something about recognising my inner brilliance, and that it is multifaceted (diamond on the ruby card). One of the great things about this circle is the fantastic sense of well being that comes from people helping you to see your hidden strengths and bring to the fore those things that we need to be addressed. Mary then asked us to pull one more card and to see whether by looking deeply into it was could see faces or animals or trees or anything other than what was presented in the picture. 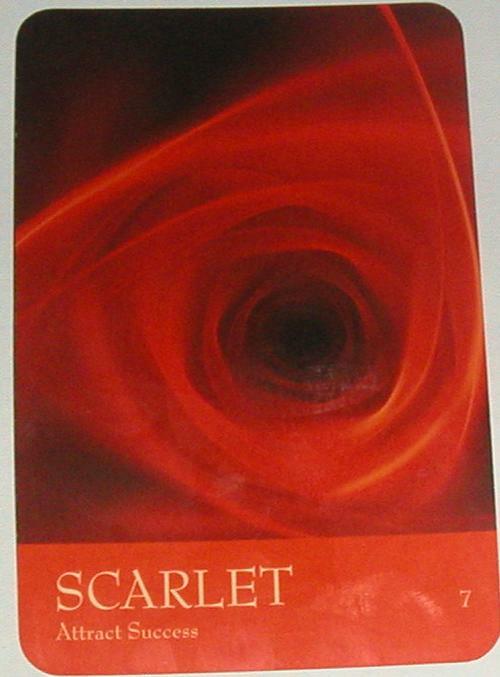 I had Scarlet – Attract Success. At first I saw a rose. After a few minutes the head of a fish became very clear. Until now I’ve been very reliant on the guide books to interpret cards, any pack, and I have several. I’ve never had the confidence to put it to one side and trust my own guide. After today it’s something I’ll be practising more. Can you see the fish in Scarlet? Can you see anything else in the other cards, like faces or animals etc? Would you have interpreted the cards differently? What do you make of the dream about the dogs? The whole dream is included at five dogs and a wolf in this site.